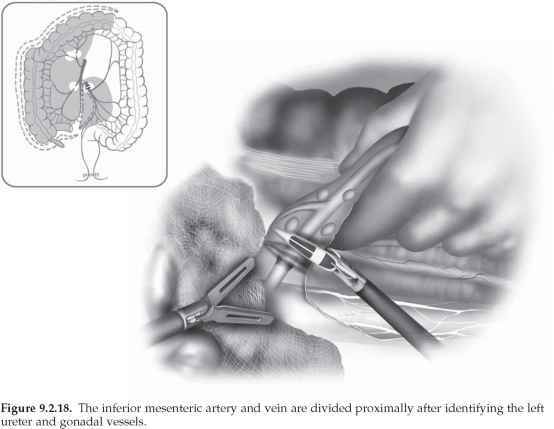 Electrosurgery is universally accepted as an important tool in open surgery. Although we do not intend to describe the principles of elec-trosurgery in detail, some basic principles should be discussed to understand the relationship between different operating modes of the electrosurgical unit. For example, tissue heating during the desiccation is a function of the amount of current flowing through a given cross-sectional area of tissue. The electrons collide with the tissue molecules, and the current is transformed into heat energy. Figure 3.2. Inverse relationship between cutting and coagulation qualities of electrosurgery. Figure 3.3. 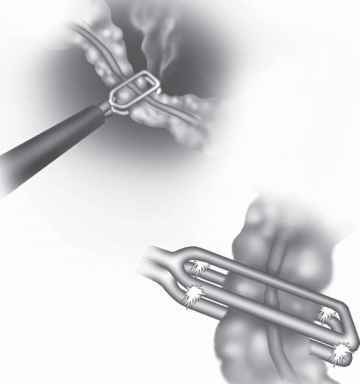 Monopolar electrosurgery, when applied to duct-like structures, may transmit a strong current through the duct-like structure, leading to damage of closely approximate tissue. the point where the current is applied. Therefore, duct-like structures with a small area of conduction are at risk for inadvertent coagulation (Figure 3.3). Understanding the relationship between current density and heat production also is essential to understanding why smaller active electrodes have a localized effect on tissue. Because the current density of a small active electrode is greater than a larger (dispersive) electrode with the same power, a local temperature increase occurs immediately below the active electrode. The current density decreases rapidly as it radiates outward from the electrode; consequently, as the distance from the electrode increases, the temperature also rapidly decreases. The shape and size of the active electrode influences current density at the tip - arcs ignite more readily from a sharp edge than from a rounded surface. Thus, a cutting waveform applied to tissue with the broad side of a standard blade electrode effectively desiccates, whereas its sharp edge will cut cleanly with the same power and mode. The electrolyte content of tissue is responsible for tissue resistance, which is between 30 (blood) to 1000 (bone) ohm/cm.4-6 Because blood has low resistance, well vascularized structures and blood vessels are major pathways for electrical current to travel through the body to the dispersive electrode. The tissue resistance increases as tissue desiccation increases, from 200-400 to 1000-3000 ohm/cm. If tissue is desiccated or carbonized, it is seldom possible to affect more tissue in that area without increasing the power or removing the eschar. In the last century, electrosurgical generators were developed that use the effect of an electrical current through tissue. The generators produce a high-frequency (HF) current (300-500 kHz). The electrical output configuration of the electrosurgical unit is usually radiofrequency (RF) isolated. There is no direct connection between the output transformer and the power ground line, so the current seeks different return ground. This configuration is chosen to prevent tissue damage in case of a nonfunctional return electrode. RF isolation best protects the patient from burns that occur at locations other than the burn site because the electrical impedance of the return path via ground is intentionally made as high as possible. The surgeon should always keep in mind that complete RF isolation is not possible. Any conductive object, including components and wiring inside the electrosurgical unit and even the surgeon, can act as a capacitor. Thus, some measurable RF leakage will always be grounded via the patient. However, RF leakage in electrosurgical units labeled as "RF isolated" must be within established standards. Even within these limits, small burns (an area of less than 1 mm2) at other contact sites may occur. Although the solid-state generators produce a standard waveform with a well-defined narrow-bandwidth, the creation of arcs during cutting or fulguration adds considerable signal energy at high and low frequencies that may interfere with other devices in the operating room. The low-frequency arc and high-intensity HF signals can interfere with pacemaker functions and stimulate tissue (muscle and nerve) to duplicate physiologic signals - for example, electrocardiogram signals. Living tissue consists of different intra- and intercellular salt solutions separated by biologic membranes. Living cells thus represent a series of electrolytic conductors so that direct or alternating current alters the membrane permeability, resulting in muscle or nerve stimulation. To reduce these stimulations, an HF alternating current is generated in the electrosurgical unit. Thus, the currently used HF, high-voltage, and low-amperage current has no excitatory effect on the body other than at the point of contact. However, low-frequency currents can arise from stray HF currents when the HF current passes through a nonlinear circuit that is not 100% resistive. A closed circuit is necessary so that electrical current can flow through tissue from an entry (active electrode) through tissue to an exit (the return or dispersive electrode). If the entry electrode is used as the active electrode and the return electrode is inactive, the application is called monopolar electrosurgery. If both electrodes are used as active electrodes, the application is bipolar. In bipolar electrosurgery, the electrodes are in close proximity; the tissue effect is localized, with very little flow of current into the patient beyond the immediate treatment zone; and only a small amount of tissue is affected. Therefore, the total power required to affect the tissue is small compared with that required for monopolar electrosurgery, in which current must flow through the body to the ground electrode. Although bipolar electrosurgery provides the safest and most controlled desiccation method using electrosurgery and more effectively controls stray current, it has a disadvantage in that it can only be used in the desiccation mode. This limitation is overcome in part by bipolar scissors that allow tissue desiccation with bipolar technology and tissue cutting with mechanical shearing. When bipolar electrodes are used, the tissue must be grasped where the electrodes are uninsulated to allow the current to pass through tissue (Figure 3.4). Standard bipolar electrodes should not be squeezed together too tightly because the jaws of the bipolar instruments may touch one another and create a short circuit (Figure 3.4). Figure 3.4. 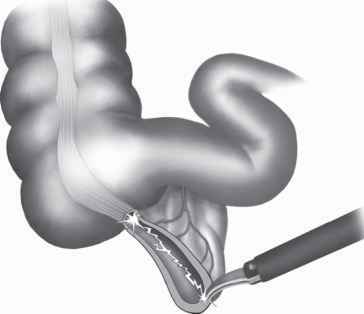 Application of bipolar electrosurgery to a mesenteric vessel. Inset: short circuit of the current between applied paddles of a bipolar unit can lead to ineffective coagulation of the tissue. Figure 3.5. 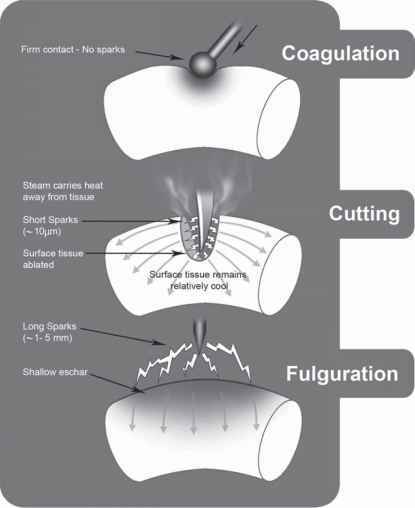 Effects of coagulation, cutting, and fulguration. Electrosurgical modes are related to the current and voltage of a specific waveform because the effect on tissue depends on the energy applied over time and whether an arc between the electrode and tissue through air is created. In general, tissue can only be cut if the tissue temperature increases rapidly above 100°C so that water vaporizes and cells explode. When tissue is heated above 50°C, protein denatures, leading to coagulation. When is bipolar electrosurgery used? What is the relation between heat and mass and electrosurgical unit?